The stamp shown above was issued in 1956. I have used it to illustrate my Labor Day poem “A Labor Day Lament,” which I wrote in 2011. Some of the references in the poem may seem dated, but my lament is still relevant, perhaps more so in 2017 than in 2011. I selected the image of the stamp to decorate the page containing my poem because it seemed relevant and was readily available. When I was considering using it again in a post on this Labor Day, I decided to look more deeply into the image on the stamp. 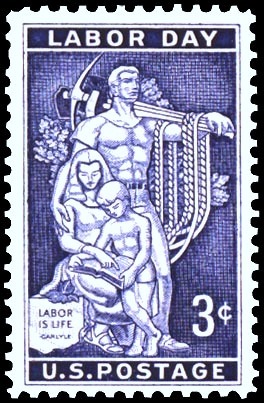 To begin with, I was surprised that the government ever issued a pro-labor stamp at all. I suspect that such a subject for a stamp would not be considered by the Postal System today. Incidentally, the stamp was a first-class stamp. In 2017, a first-class stamp costs 49¢, representing something like a 1500% price increase. The image on the stamp is derived from a large mosaic in the south lobby of the AFL-CIO headquarters in Washington, D.C. The mural, which contains elements not shown on the stamp, was designed by Lumen Martin Winter and executed by the now defunct Ravenna Mosaic Company. President Eisenhower dedicated the building containing this art work in 1956. One cannot imagine President Trump presiding at such an event. Whereas there is much to be admired in the Winter mural, it is clearly a product of its time and, perhaps, not the best image for our own time. 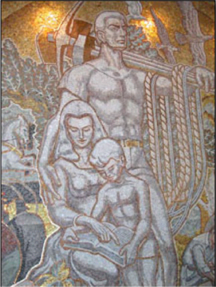 “Labor Is Life,” as the mosaic is generally known—Carlyle is so quoted in the mural—shows a male worker protecting his wife and son. The woman is teaching the boy, presumably about work. There is no suggestion that the woman has any bread-winning chores. “Labor Is Life” is, therefore, rather sexist in its representation of the “ideal” nuclear family of the 1950s. The labor movement in the United States has, in many ways, been a progressive force in the country. Certainly, it has been responsible for higher pay for workers, for more humane work hours, and for safer working conditions on the job. On the downside, labor unions have been dominated by men, primarily European, Christian, white, heterosexual men. Unions have a spotty record of seeking to benefit all workers and have often engaged in mean-spirited discrimination. We need unions, however. The lack of union strength has contributed to wage stagnation in the U.S. Unions need to fight for the right to organize, particularly in red states, and need to stand for fair treatment for all workers. On this Labor Day, let us hope and work for a resurgence of organized labor in the United States. NOTE: My previous post on Labor Day can be found here.